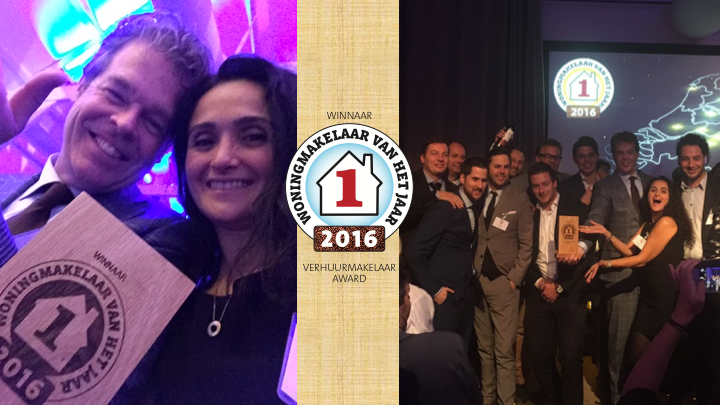 Tweelwonen Rental Broker of the year 2016! In the evening of November 24, 2016 the Property Broker of the Year Awards are awarded under the watchful eye of prominent people from the Dutch brokerage, In five categories the customers voted who went away with the wanted titles. Tweelwonen won the Award for the Rental broker of the year 2016. 5 months, customers could vote on their favorite broker ito win the prize for the best broker. Tweelwonen may call themselves the Rental broker of the year 2016 thanks to the strong support of its customers. Quality, customization, sustainability, proper application of Laws but especially the centrality of the customer stands at Tweelwonen importance and finally a very big difference between other brokers was made in the assessment of their customers.